Many of you woke up this morning to chilly temperatures on your way out of the door. This can be thanked, in large part, to the cold front that moved through late yesterday. 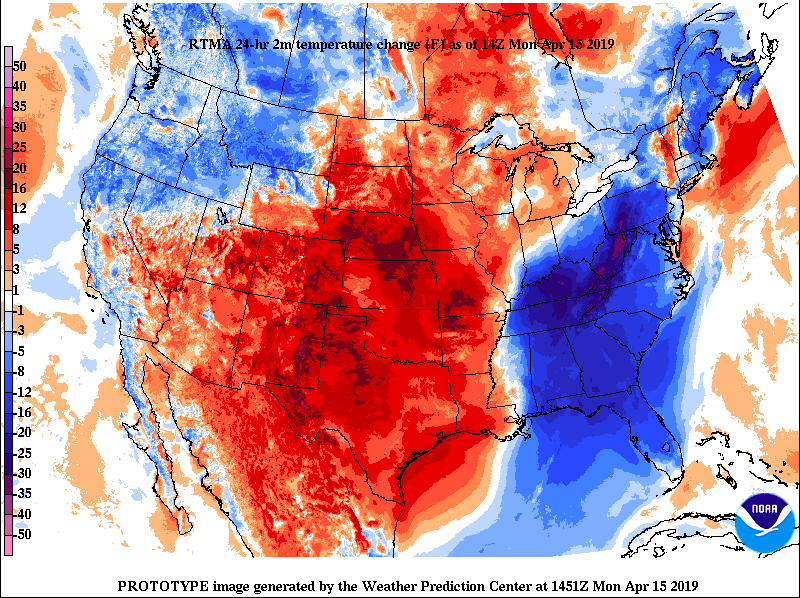 As seen below, much cooler temperatures have swept through much of the southeast the past 24-hours. As for today, expect a pleasant day with temperatures on the cooler side of things. By this evening we will have a high pressure system move right over the Tennessee/Kentucky region bringing with it much warmer temperatures Tuesday and the rest of the week. This high will also allow us to stay dry and see plenty of sunshine for the next few days. This high pressure system will make its way from our southwest into the Ohio valley region (by tonight) before being forced out by another low toward the end of the week. We can enjoy a few days of great Spring weather before the next system moves in Thursday. This next system has potential of causing some severe weather, so make sure to check back in to see what you can expect.